silicon and carbon subunits by doping and hybrid formation two directions will be pursued: i) the possibility of formation of endohedrally trapped metal atoms and clusters within carbon and silicon cages and ii) interaction of metal clusters with three-dimensional and two-dimensional carbon nanostructures such as nanodiamonds and graphene. 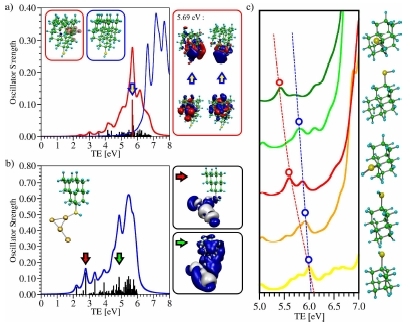 For this purpose we will use and advance the combination of time-dependent density functional theory (TDDFT) and its tight binding version (TDDFTB) with nonadiabatic dynamics for description of coupled electronnuclear dynamics. The ultimate goal is to propose building blocks for sensing and photonic materials based on metal cluster chromophores stabilized through hybridization with carbon and silicon structures, in close cooperation with experimental groups.